Tagore’s work had from the very first moment a great impact on fellow poets and literature in general. Amongst the earliest translators are some who became themselves very famous as Nobel laureates, like Gide and Jiménez. 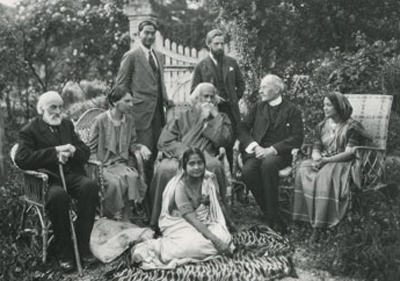 Glimmering through the early reception of Tagore’s work, via his translators, is an opportunity to gain some insight in the world of cultural elites during the 1920s and 30s. None of the early translators was able to translate directly from the Bangla original, with only a few exceptions like Helene Meyer-Franck. Also, some fame must already have existed, as for instance the composer Ciurlionis, who died in 1911, is said to have been influenced by Tagore. Song-Offerings was published in 1913. Not a translator, but nevertheless very important, is William Butler Yeats (1865-1939), who advised Tagore in the publishing of his first bundle, Gitanjali, or Song-Offerings. Yeats wrote the introduction to the first edition. In 1923 he was himself rewarded the Nobel prize. is sitting in between his friend Romain Rolland and Romain’s sister Madeleine Rolland, their father at the most left (1926, picture from Collection Monique Dupont-Sagorin). This advantage did or does not befall later translators. Amongst the earliest translators were almost none who could understand the value of the original Bengali texts. Though some did find in the power of Tagore’s English translations the motivation to start learning Bengali, like Helene Meyer-Franck. She originally translated from the English also was able to translate from the Bengali originals. Of the later "modern" translators many are able to enjoy Tagore’s literary output from its Bengali original writings. No doubt this is also an important advantage. Though the original English translations made by Tagore himself still are of great value. Till this day, these early translations form the bulk of texts set to music. Otto Mellies (1931) is a German actor. He has published several audio books on Tagore, like Am Ufer der Stille (Patmos, 2002), which uses a collection with the same title in Martin Kämchen’s translation. I wish to know the name of the first German translator of Gitanjali in Kurt Wolff edition of 1913. Can you please help? I am surprised to see Andrea butenschon,the translator of biography of Moghul princess from persian to English,also translated the The Geethanjali of Tagore from Bengali to Swedish. Is she a German lady or Swedish lady,I want to know out of curiosity. I need her life sketch if can get from any body,I am charmed by her trasnlated memoires of Jahanara. Dear Santhe, curiousity is also for me a great source of inspiration. And as more and more information is being published online, also information about Andrea Butenschön (1866-1948) is now available. Like in Wikipedia in German, also available in Swedish of course. I have just read the article about this very inspiring woman. And this it says, in short: her father was German, her mother Swedish, she was being raised in Sweden. To become the first female student at the Sorbonne in Paris to study Sanskrit. In 1891 she travelled through India. Before the Nobel prize was awarded, Gitanjali (Sångoffer) was translated in 1913 from the English version, though not from the Bengali.